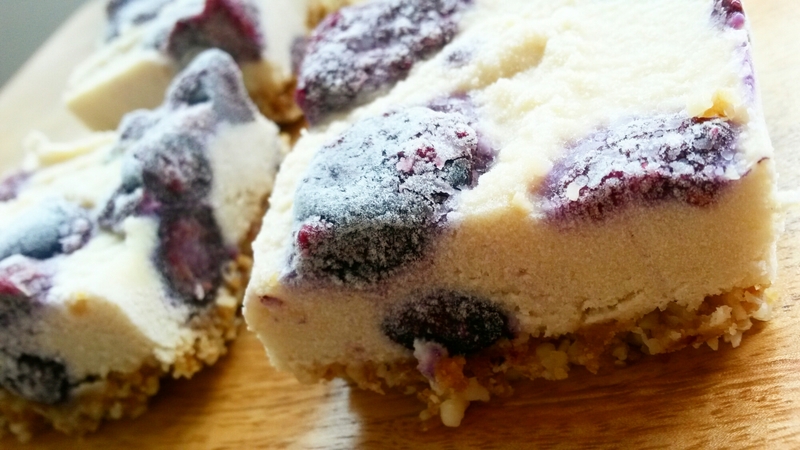 I make several variations of this cheesecake but at the moment Amelie (my two year old) is obsessed with blueberries. So this was created just for her really. If you’re new to my blog, I try to limit the amount of refined sugar, dairy, wheat, chemicals and nasty saturated fats (by no means do I mean avocados or carbs) in all the foods we eat as a family, particularly her food. This recipe is a much healthier alternative and I know every single ingredient I am putting in to this dessert. The maple syrup is 100% organic maple syrup, the oats are organic and gluten free and there is no dairy whatsoever. If you have a nut allergy then this isn’t for you, sorry! All you need to make this cheesecake is a food processor, a freezer, a 7×7 inch cake tin with a loose bottom. Oh and the ingredients listed below as well as 20 minutes to spare. Throw all ingredients in to a saucepan, stirring the mixture together over the heat for roughly 5 minutes. Do not let the mixture boil. Pour the mixture in to a separate bowl and stir in 1 tablespoon of chia seeds and leave to one side until later. Blitz the almonds and oats together in the food processor. In a separate bowl mix the remaining ingredients and then massage those ingredients together with your hands and it should start to caramelise. Once it starts mushing together wack that in the food processor with the almonds and oats and blitz again. Pour the mixture in to a 7×7 inch tin (round or square your choice). Push the mixture firmly down in to the tin with the back of a spoon, make sure it’s really compact and then put in the freezer whilst you make the next section. Drain the cashews from their overnight soak and then blast in the food processor until mushy. Add the water, lemon, coconut oil, and maple syrup and blitz again until nicely combined. 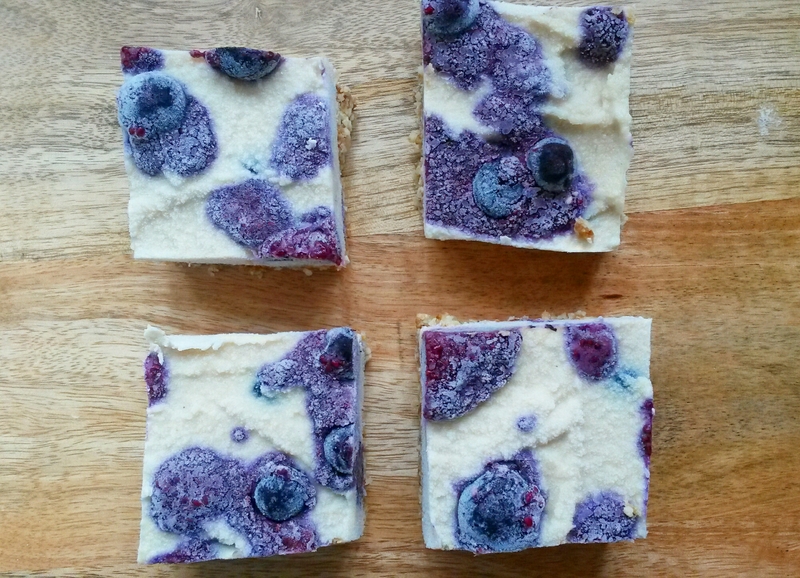 Take your base out of the freezer and sprinkle some fresh blueberries on top of the base. Then pour your cashew cheesecake mix over the top. Next splodge your blueberry sauce (mixture that you left to one side) over the top and put back in to the freezer for at least 4 hours. Take out the freezer, leave for 15 minutes before cutting in to sections. This cake needs to be stored in the freezer, however I do like to take mine out the freezer about 15 – 20 minutes before I’m going to eat it as it just tastes better that way. If it’s too frozen you can’t taste the flavours as well. If you make this let me know how you get on. Any feedback is appreciated. Take care of yourselves – eat well, sleep well, get fresh air and drink plenty of water!